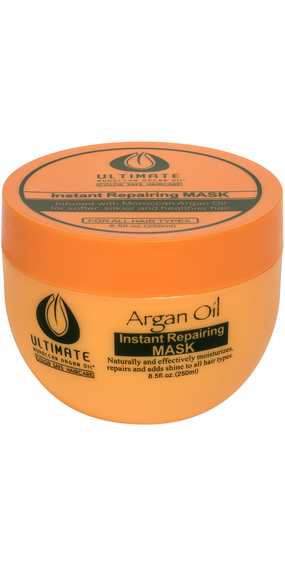 Give your hair the strength and shine it deserves with the ULTIMATE Moroccan Argan Oil® Instant Repairing Mask. Made with a special blend of ingredients, including argan oil, this unique mask will rehydrate, revitalize, and repair your strands so they stand out with a lustrous shine and silky smoothness. With continued use your hair will gain the manageability and elasticity that you have always wanted. Add it to already healthy hair for a brighter shine and even stronger strands. Distribute a teaspoon of mask evenly through clean, damp hair, using more for longer hair. As a second application, apply to ends and try a wide-tooth comb for more even distribution. Leave in for 10 minutes and then rinse thoroughly with warm water. After application, cover your head with a plastic cap and let process under warm dryer or hot towel for 5-10 minutes, rinse well with warm water. Towel dry hair and proceed to styling.